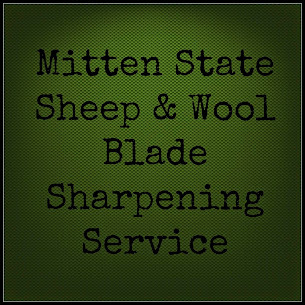 Mitten State Sheep & Wool : Sheep Shearing Postponed! 7:15 CLOUDY! But it was cloudy yesterday...not suppose to rain today. 7:20 Honey it looks like it is going to rain..not suppose to rain today. 7:25 5 minute down pour. Not enough to actually benefit the garden, or fruit trees but enough to cancel shearing today! It has been a dust bowl around here for 2 weeks. We would have bought the sheep in the gray barn if we had any idea it was going to rain. We spent yesterday evening setting up a pen outside so we could do the shearing in the red barn (a much nicer barn). Well even the best laid plans can be brought to a halt by Mother Nature! Side Note: You do not shear WET sheep! Bright Side: The alfalfa seed that was drilled in last night got a little damp!